There is no need for any special preparation. You may eat and go about your normal activities unless otherwise informed. Do continue to take all your medications prescribed by your doctor and follow your doctor’s orders as usual. An echocardiogram is a noninvasive test that uses high-frequency sound waves (ultrasound) to examine the heart’s anatomy and function. This test provides information about your heart’s size and function, the appearance of the valves and the thickness of the heart muscle. The entire test takes less than one hour. 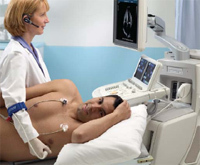 The echocardiogram will be performed by a sonographer, a specially trained ultasound technologist. You will be asked to disrobe from the waist up and will be provided with a gown. You will lie on an examining table and the sonographer will attach small adhesive patches with wires to record the timing of your heartbeat. The sonographer will obtain ultrasound pictures of your heart using a small hand-held transducer and water-soluble gel. The lights will be dimmed to reduce glare so the sonographer can better see the picture monitor. Changes in body position are sometimes needed to get enhanced pictures. At times, the technologist may need to apply added pressure with the scanning probe to visualize certain areas requiring additional views. While the Doppler ultasound test is performed, you will hear a swishing sound as the instrument receives and processes the signals. 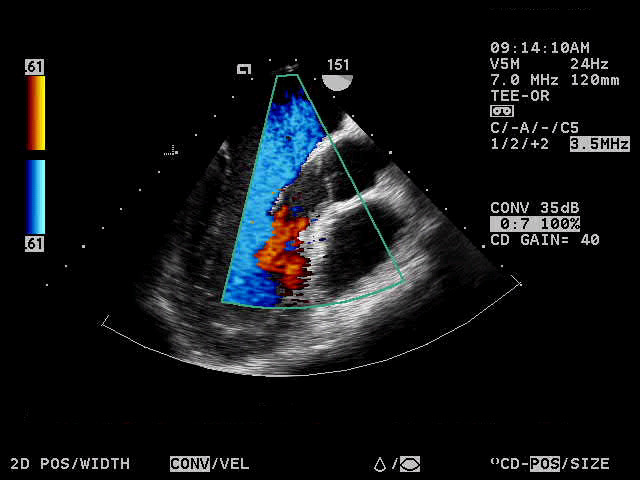 Doppler ultrasound is particularly helpful in the evaluation of heart murmurs. 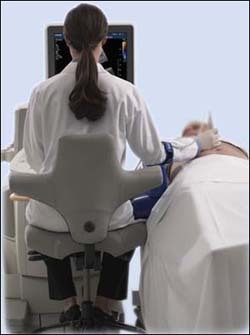 Color ultrasound imaging provides additional information about direction and distribution of blood flow. When this is being performed, you will notice multiple colors on the monitor screen. The echocardiogram test includes Doppler and color evaluations of your heart. Sound waves do not cause pain. The only discomfort you may experience would be related to the pressure of the transducer against your skin. There are no reports of complications related to the use of diagnostic ultrasound.